Palm Sunday is the first day of Holy Week. 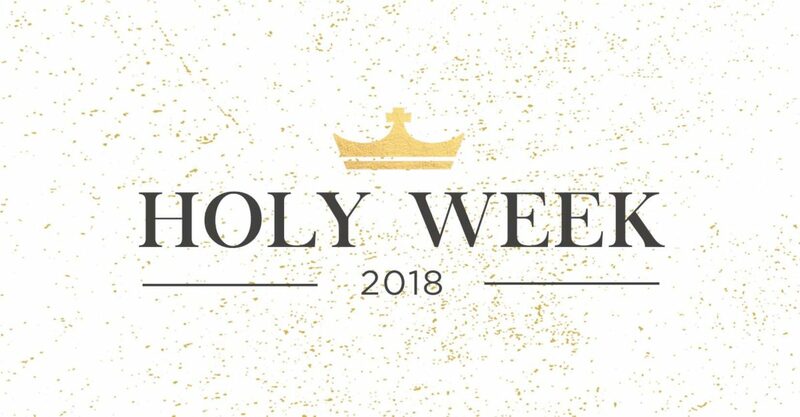 Throughout this week we reflect on the last seven days of Jesus’ earthly ministry, remembering the significance of everything He did between His entrance into Jerusalem, His death on the cross, and finally His ascension into heaven. We refer to this day as “Palm Sunday” in remembrance of what happened during Jesus’ triumphal entry into Jerusalem. While entering the city, many people began to lay down their clothes on the road and others cut branches from palm trees and laid them down as a sign of respect to who they knew Him to be (John 12:13). As we look at this passage, the opening story may seem strange. You might ask yourself why Jesus felt the need to go out of the way and find a colt to ride into Jerusalem, or why this story was even mentioned. If we look to the rest of scripture, we find a beautiful answer. Zechariah 9:9 says, “…your King is coming to you; he is righteous and victorious, humble and riding on a donkey, on a colt, the foal of a donkey.” This verse prophesied the exact way in which Jerusalem’s Savior would enter the city over 500 years before Jesus was even born. In other words, sending Jesus was never God’s plan B. From the very beginning, through war, famine, and the destruction of kingdoms, God knew what He had in store to ultimately reconcile Himself with His people. He even had planned the exact animal His Son would be riding as He entered the city. Moreover, He didn’t randomly decide to use a donkey. Jesus rode a colt into Jerusalem as a reflection of His humility. Even as the true and perfect King, Christ showed us that righteousness and victory did not need to look like a wealthy and armed king, regally riding in on horseback. Christ’s power was shown in the way He lowered Himself below those that needed to be saved. He shows us this on Palm Sunday with the humility He had as He entered Jerusalem, and we will see this again on Good Friday as we remember how He laid His very life down for our sake. In light of the power and might of our Savior, do you ever forget how humbly He came to this earth? Why do you think He came in this way? In what ways in your life are you reflecting the humility of the God who saved you? As the passage continues, we see Jesus worshipped with shouts of praise as He enters the city. Of course, not everyone was pleased with the recognition that Jesus was receiving. In verse 39 we see the Pharisees tell Jesus to rebuke his disciples, and He responds mysteriously by saying, “if they were to keep silent, the stones would cry out.” Though this phrase may seem cryptic, Jesus is emphasizing how worthy He is of praise. He is saying that even if the people were to stop worshipping, nature itself would begin shouting praises. This is not only an incredible reminder of how glorious our Savior is, but also how incredible it is that He chooses to include us in his glorification. Most of the crowd did not even recognize Him as the Messiah, but merely a prophet (Matt 21:10-11), and the disciples didn’t even realize that this was all a fulfillment of prophesy (John 12:16). Nevertheless, He continues to use imperfect people as a part of His plan to establish His kingdom. This is so important for us to remember in our daily lives. Though we often consider ourselves unfit to do God’s work, we must recognize that out of His abounding love for us He has chosen to include unqualified human beings into His plan. Though rocks could do the work if He wanted them to, He has destined His broken image-bearers to carry out His work instead. How different would your life look if you trusted God’s ability to use broken and imperfect people? How differently would you treat other people if you fully recognized that God Himself loves and includes unqualified mess-ups in His plan?